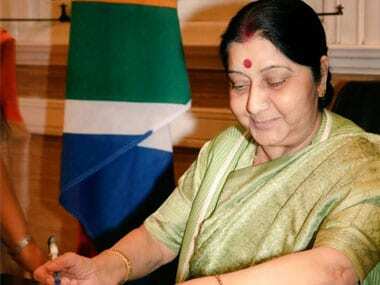 Pietermaritzburg: Mahatma Gandhi and Nelson Mandela gave hope to those facing injustice and discrimination, External Affairs Minister Sushma Swaraj said in Pietermaritzburg on Wednesday, as she recalled India's role at international forums to help South African people in their fight against apartheid. Swaraj was the keynote speaker at a banquet at the City Hall in Pietermaritzburg marking the 125th anniversary of the day when on 7 June, 1893, Mohandas Karamchand Gandhi, a young lawyer then, was thrown off a train compartment reserved for whites only. She said the two leaders gave hope to the enslaved people of this world, whether under colonialism or apartheid. "It was in Pietermaritzburg that hope was redefined by two of the greatest leaders of our times. They gave hope to the developing countries, especially India and African nations, by finally freeing them from the yoke of colonialism." "They gave hope to generations to come, by ensuring that our values and principles, which we hold sacred, are forever enshrined in our psyche and in our Constitutions," Swaraj said. She quoted Mandela when he officially unveiled a statue of Gandhi here 25 years ago, "In his speech, Mandela said 'now more than ever is the time when we have to pay heed to the lessons of Mahatma Gandhi'." Swaraj lauded the role of Indian-origin South Africans in the struggle for freedom. "The history of South Africa is full of tales of individuals who gave up their today for a better tomorrow. The story of the people of Indian-origin is a story of undaunted determination and courage, as they made sacrifices in South Africa's long struggle against colonialism and apartheid," she said. Swaraj recalled the support that India provided to South Africa at international forums during its struggle against apartheid. "India was the first country to sever trade relations with the apartheid government in 1946, and subsequently imposed a complete diplomatic, commercial, cultural and sports embargo on South Africa. "The African National Congress maintained a Representative Office in New Delhi from the 1960 onwards. And at the end of apartheid, India immediately re-established relations with South Africa in 1993. 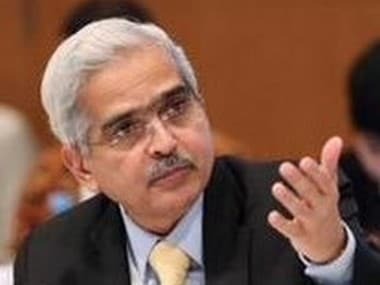 Since then there have been a steady consolidation of our close and friendly ties with South Africa, both bilaterally and through BRICS, IBSA and other regional and multilateral fora," she said. Swaraj also highlighted the participation by South African youth in various programmes run by India. "Youth are our emissaries for the future. I am happy to learn that in 2017-18, 28 young men and women from South Africa visited India through the Know India Programme. Last year, 48 South African went on the ITEC and ICCR African scholarship programmes to India," the minister said. 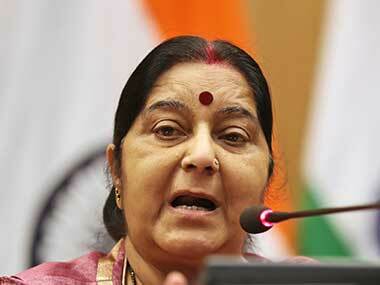 Swaraj said India and South Africa are marching hand-in-hand towards peace, prosperity and development. "The world is a better place because of us. The world has much to gain from us. The world looks up to us to provide leadership." she asserted.